The Cold Steel 1849 Rifleman’s Knife is hand forged from 1085 High Carbon steel, with a solid brass guard and beautiful Rosewood handle scales that encapsulate the sturdy full tang. 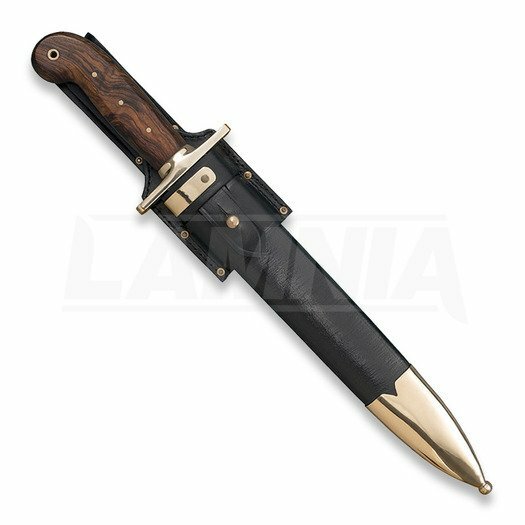 The Rifleman’s Knife is sold complete with a high quality hand-stitched leather sheath and belt frog, with polished brass throat and chape. Perfect for re-enactors and collectors alike. Add one to your collection today!